The beautiful city of Gdansk played a major role in perhaps two of the most important events of the 20th century in Europe. Here in 1939 Germany's invasion of Poland began which exploded into World War II. Here too the Solidarity movement was born in the 1980s, leading to the fall of communism in Poland and setting the groundwork for its later collapse in the rest of Eastern Europe. An important seaport on the Baltic and situated between former Slavic and Germanic lands, Gdansk has a complex and fascinating history. On Long Street in the heart of the old town the 14th century Town Hall sports a gilded statue of King August of Poland. The Neptune Fountain is the center-piece of this street and reminds us the affinity of Gdansk to the Sea. The Gothic Artus Court with its magnificent 11 meter tiled stove, adorned with coats of arms and personifications kings is an unforgettable sight. The Long Wharf boasts an original medieval port crane on the Motlawa River. Saint Mary’s Church is the largest medieval shrine built of brick in Europe. Restored to its former beauty in the 1980s which it can now be enjoyed in its full splendor. 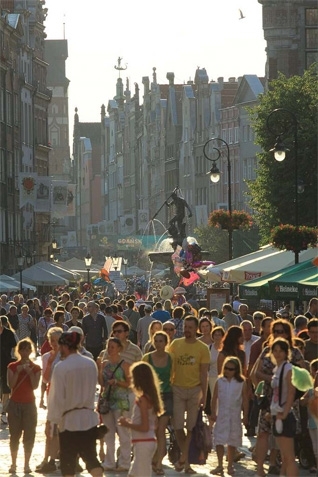 Gdansk, a seaport and Hanseatic City, a royal city, sometimes occupied and at times a “free city”, let our guides unfold its fascinating story through its streets, buildings and monuments. Gdansk is also one of our many port destinations. If you plan to come to your guided tour(s) by cruise ship, we would be more than happy to arrange for your transfer and arrival! If you would like more information on our private tours in Gdansk, please fill out the form below - or call us directly under +49 30 61 62 57 61. Driving tours starting at 500 EUR for 4 hours.